Melt butter in a small skillet and sauté celery, onion, and parsley until tender, about 4-5 minutes. Add oysters and cook until oysters are heated. Mix lightly with remaining ingredients. To bake dressing in pan: Preheat oven to 350°F. Butter a 15 x 10 inch baking dish. Transfer stuffing to prepared dish. Cover with buttered foil and bake until heated through, about 45 minutes. Uncover and bake until top is golden brown, about 15 minutes. Put bacon fat in a 3 quart saucepan over medium heat. When hot, add chopped onions. Cook onions until clear but not brown. Add oysters, with liquid, and cook until oysters curl. In meantime, add a handful of chopped onion tops and parsley. Add milk and heat. Serve immediately. Chef’s note: Medium oysters are more flavorful than small or extra small. Cut them into bite sized pieces. Oysters on the Barbeque Heat barbeque to medium heat (~375 deg C). Place oysters on grill with the cupped shell on the bottom (keeps juices in the shell) and the hinge facing the back of the grill (so you can see when they start to pop open). Close the cover and begin checking for the shells to pop open after 4 minutes. Once the shells begin to pop open, remove top shell and assist any stubborn oysters by inserting your knife in a gap between the shells. Return to grill for further cooking as necessary. Dip in melted garlic butter. 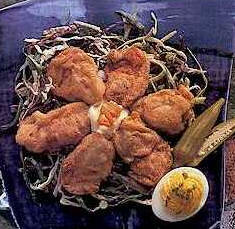 Goop Stir together 3 tablespoons of mayonnaise with 4 tablespoons of Ketchup for the perfect fried oyster dipping sauce. In large soup pot or Dutch oven, heat oils over moderate heat. Add ginger, garlic, and lemon grass and cook, stirring, 30 seconds. Add fish sauce, coconut milk, soy sauce, red curry paste, sugar, lime juice, and clam juice. Bring to boil. Immediately add clams, carrot, bell pepper, and green onions. Cover and steam clams in broth 3 to 5 minutes until clams just open up. Discard unopened clams. To serve, divide clams, vegetables, and broth among warm bowls. Sprinkle with cilantro leaves and serve with lime wedges.